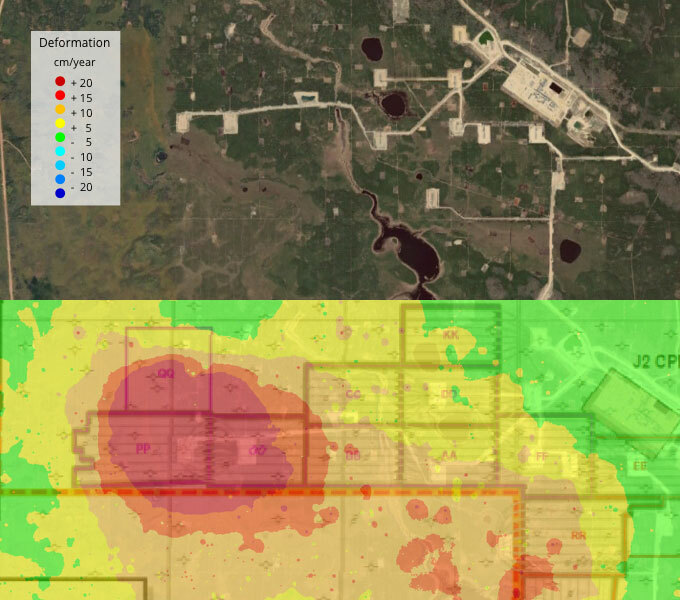 We are the worldwide leader in providing excellent ground deformation maps. Our mission is to deliver the highest quality and most affordable surface displacement information with radar technology. We are experts in SENTINEL-1 and many other radar satellites. Thanks to our unique and extensive experience we provide optimal solutions that fit best with our clients’ needs. Red and orange measurement points indicate areas with instabilities in the Eastern slopes of the pit, whilst blue measurement points show unstable area on opposite slopes (Western slopes of the pit). 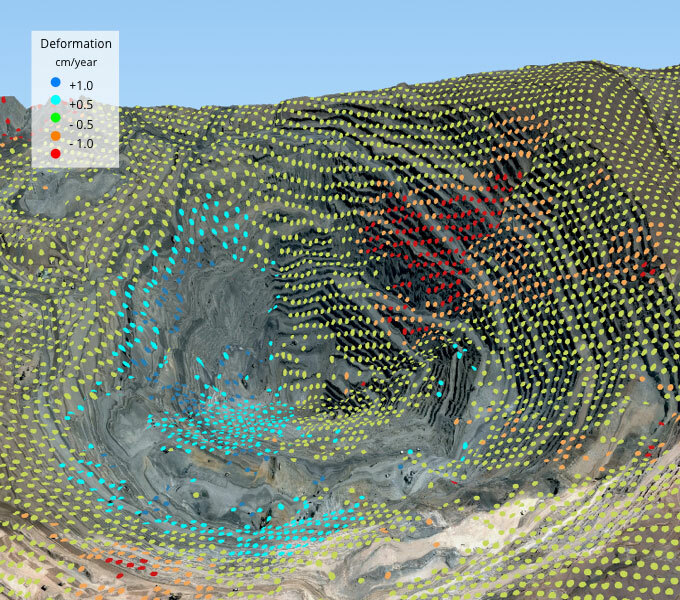 The geomechanical information about unstable slopes helps geotechnical and operations teams to take decisions regarding safety to prevent accidents. The map shows the millimietric subsidence patterns on buildings where the new subway Line 9 is constructed. Subsidence evolution in time correlates perfectly with tunneling construction activities. 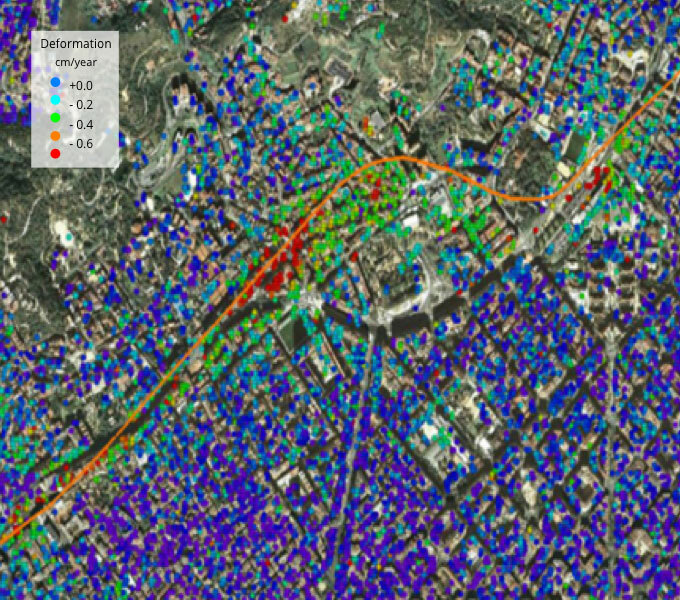 Spatial extent of subsidence patterns as well as their magnitude can be correlated with civil engineering models to assess the viability and impact of tunneling works. Steam chambers have been localized successfully: Heave of more than 2 cm per year was detected over most active wells, meanwhile surface stability can be observed over less recent wells. This information helps geomechanical teams to understand better sub-surface geology and reservoir behaviour and dynamics leading to operational cost savings. We work for private companies and governmental institutions to address challenges on a worldwide scale. We classify our services into four main pillars. We provide high quality and affordable ground deformation measurements in order to monitor surface anormalies. We deliver customized radar and processing software trainings, as well as advanced InSAR data interpretation courses at our clients’ premises. We actively take part in international R&D consortiums (such as ESA, H2020, CDTI) for new radar application development and new satellite mission performance studies. The latest updates and trends in our field. Be informed about DARES news about satellite monitoring services. Contact us in Spain, Chile, US, Canada, Australia, Germany and Turkey!